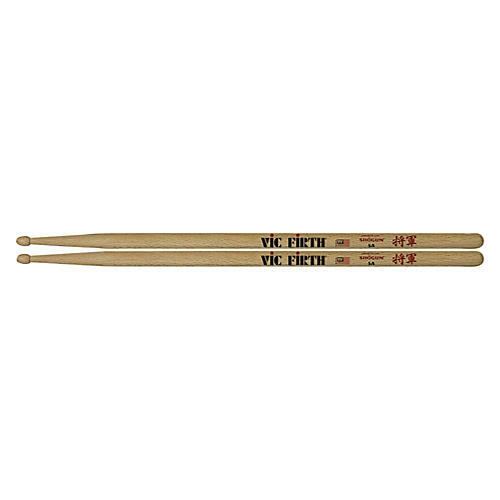 Featuring a more rigid response than hickory, the dense Japanese white oak construction of Vic Firth's Shogun 5A sticks provides added weight and power for a full drum sound and strong rhythmic projection. The hardness of the wood tip in oak creates a brighter cymbal sound and provides excellent definition during intricate ride patterns. This unique wood also produces an incredible cross-stick tone that really cuts through. The 5A stick size is ideal for versatile percussionists with styles ranging from orchestral to light rock. The 5B stick size is ideal for percussionists seeking mid to high volumes - namely in marching band or rock applications.